An Egg Gunner yelllow model in Aquatic Base. These advanced Egg Gunners are combat automatons constructed by Dr. Ivo "Eggman" Robotnik, deployed by the mad scientist in and around Soleanna during Sonic the Hedgehog (2006). They are named only in the game's official strategy guide. A variant of the more common Egg Gunner robot, painted yellow instead of white, this unnamed model is equipped with two missile launchers in each arm along with a propulsion unit mounted on its back. It attacks by firing said homing missiles when the enemy is far away or using the vulkan cannon when its close. 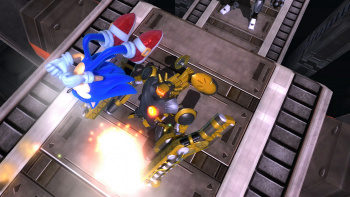 The missiles are pickable by Silver's psychokinesis and it has strong armour, taking three hits to destroy.